Everyone must have at least once heard about or played the so called “wheel of fortune”, either live or in a form of a video game. Well, the IGT software development company, based in London, UK decided to incorporate this game with some pokie elements and as a result they have released the Wheel of Fortune: Triple Extreme Spin online video slot! This creative combination promises a lot of fun as well as the possibility of scoring some serious payouts! As said above, this entertaining creation comes straight from the “kitchen” of a well-known developer in the online gaming world – the IGT companyThey are recognizable by their innovations and proven solutions for gaming and lottery as well as for their leading-edge technologies considering interactive and social gaming. All of this confirms that the players will surely enjoy each and every game released by this developer, as well as their amusing creation called the online Wheel of Fortune: Triple Extreme Spin. The size of a single coin ranges from 1 up to 50. The amount of coins per one line can’t be modified and it’s 50. The theoretical return to player percentage is 96.08%. Additional bonus games are included, as well as multipliers and the possibility of earning some extra free spins. The autoplay option is embedded too, for all those players who get bored by clicking the “spin” button repeatedly. One can play free Wheel of Fortune: Triple Extreme Spin casino slot machine with no need for download or registration. And, of course, for those players who like to feel some thrill during the gameplay, there is a real money gambling option. IGT also released a mobile version of this amusing pokie, which is supported by both leading platforms (Android and iOS), so the players can enjoy it even when they are on the move! Regular tokens can be divided into lower paying ones (mostly illustrated as fruits) and higher paying ones (yachts, luxury cars, jewelry etc.). The one that is worth the most among them is definitely the Wheel of Fortune token, which can bring one payoff up to x10000, which is essentially the jackpot prize! Wild icon appears only on reels from 2 to 4. It can’t form the paying combination on its own, but it has the ability to substitute all the tokens, except for the scatter, bonus and the Wheel of Fortune symbol. Three central columns contain stacks of 2x wilds that count as two symbols if they get involved in the winning combination. Scatter token has the power to trigger the Mini Wheel Bonus feature, if one manages to land three or more of them regardless of their position on the columns. When this happens, scatters transform into wheels that start spinning instantly. One can get up to five wheels (for five scatters landed). Prize values displayed on those wheels are being summed together to calculate the total amount of the prize won. In this bonus feature one can get awarded up to 77x his stake. Mini Wheels bonus feature potentially pays from 50x up to an astonishing 3850x the coin value. 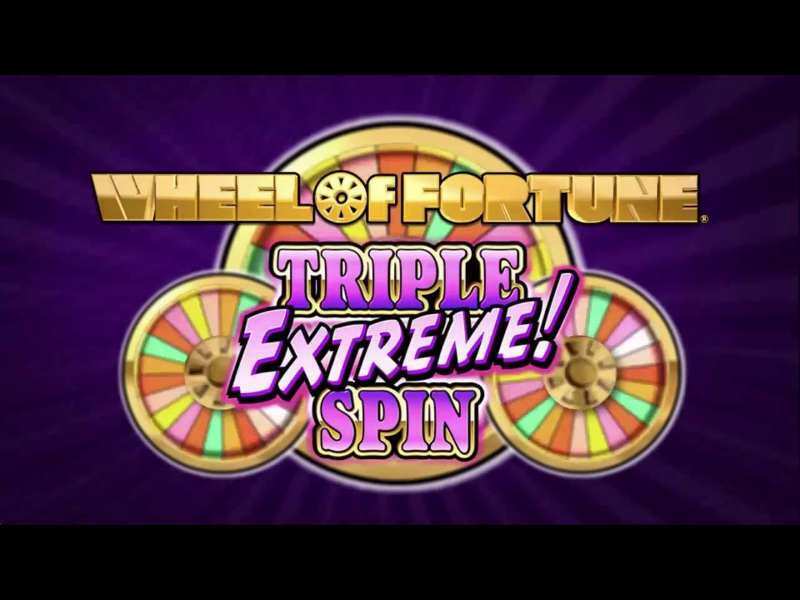 Wheel of Fortune: Triple Extreme Spin slot’s bonus symbol triggers the so called Triple Extreme Spin bonus, which will be thoroughly reviewed in the text to follow. As said above, the Wheel of Fortune: Triple Extreme Spin comes with two bonus additions, the Mini Wheel bonus (which is explained in the previous chapter) and the Triple Extreme Spin bonus, which is this game’s main feature. First, to activate this bonus feature, one must land three or more bonus symbols anywhere on three middle reels. Bonus token is displayed as three small wheels of fortune. Blue wheel – 30 to 1000 coins. Red wheel – 100 to 5000 coins. Yellow wheel – 2x, 3x, 4x, 5x, 7x and 10x multipliers. So, if one feels eager enough to play this astonishing game, a good place to visit would be Money Online Slots, where one can find slots similar to this, such as Mega Fortune Dreams. 0 responses to "Wheel of Fortune: Triple Extreme Spin Slot"